Unilever PLC (UL) operates as a fast-moving consumer goods company in Asia, Africa, Europe, and the Americas. This international dividend achiever has paid dividends since 1937, and has increased dividends for 19 years in a row. The company's last dividend increase was in June 2014 when the Board of Directors approved a 5.90% increase in the quarterly distribution to 28.50 eurocents /share. The company's peer group includes Nestle (NSRGY) and Procter & Gamble (PG). Over the past decade this dividend growth stock has delivered an annualized total return of 10.30% to its US shareholders. The company has managed to deliver a 9.20% average increase in annual EPS since 2004. Analysts expect Unilever to earn $2.15 per share in 2015. In comparison, the company is expected to earn $2.01/share in 2014. Over the next five years, analysts expect EPS to rise by 4.10%/annum. All this information is in US dollars however, while the company reports earnings in Euros. While earnings appear to be flat in dollars over the past 5 years, they actually increased in Euros. The company is dually listed in the U.K. and the Netherlands. There are two classes of ADRs available for US investors, one for the U.K. listing - Unilever PLC (UL) and the other being Unilever N.V. (UN) in the Netherlands. For U.S. investors, the U.K. traded shares are much more desirable, because the U.K. does not withhold taxes on dividends. This makes the Unilever PLC (UL) shares best for retirement accounts. In a taxable accounts for investors already paying 15% on dividends, it might make slightly better sense to buy the Unilever N.V (UN) shares, since they are always selling at a slight discount. A large share of Unilever's sales are derived from emerging markets, where revenue growth is expected to continue at a high single digit to a low double digit rate of increase. The company has also been able to pass on increases in prices of raw materials onto consumers, who purchase its branded products globally. The risk behind this strategy is if Unilever increases prices too rapidly, sales volumes might suffer as a result. Typically however, while the market for food and personal consumer products is highly competitive, demand is stable and relatively immune from economic stress. The company's strategic plans have revealed that it expects long-term sales growth of 3%- 5% per year. 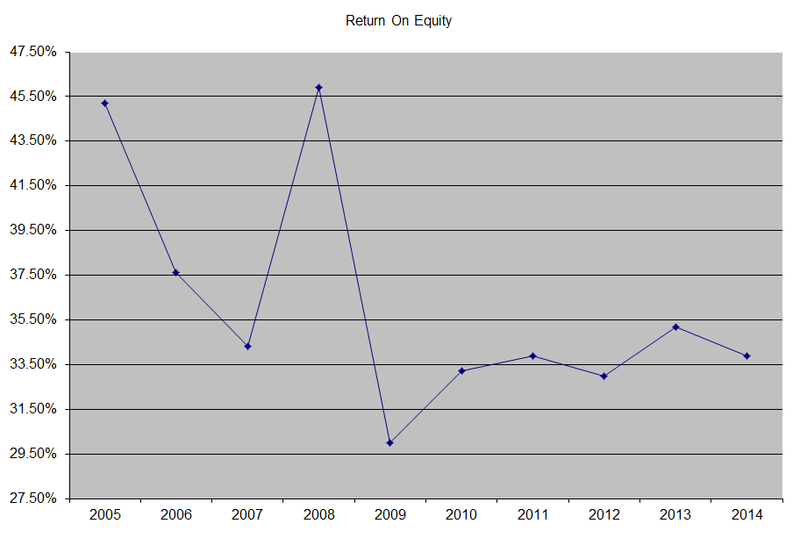 The company generates a very high return on equity, which has declined however over the past decade. I generally want to see at least a stable return on equity over time. I use this indicator to assess whether management is able to put extra capital to work at sufficient returns. The annual dividend payment has increased by 7.50% per year since 2004, which is slower than the growth in EPS. With international dividend achievers, it is important to look at the trend in distributions in their base currencies. Despite the fact that the annual dividend payment appears volatile in US dollars, the growth in distributions in Euros has shown a consistent upward trend in distributions. A 7.50% growth in distributions translates into the dividend payment doubling almost every nine and a half years on average. If we look at historical data, going as far back as 1996, one would notice that the company has actually managed to double distributions every nine years on average. 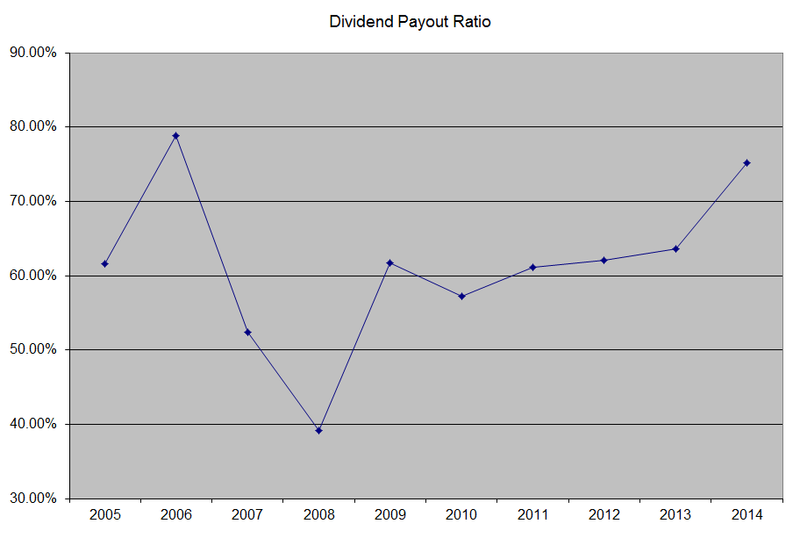 The dividend payout ratio has remained at or above 60% over the course of the past decade, with the exception of a brief decrease below in 2007 and 2008. Currently, this ratio is above 70%, which is not something I would like to see in a company I am considering purchasing. A lower payout is always a plus, since it leaves room for consistent dividend growth minimizing the impact of short-term fluctuations in earnings. Currently Unilever is slightly overvalued at 20.90 times earnings, yields 3.10% and has a sustainable distribution. Since the stock is trading above a P/E of 20, I would only consider adding to my position there on weakness in the share price. 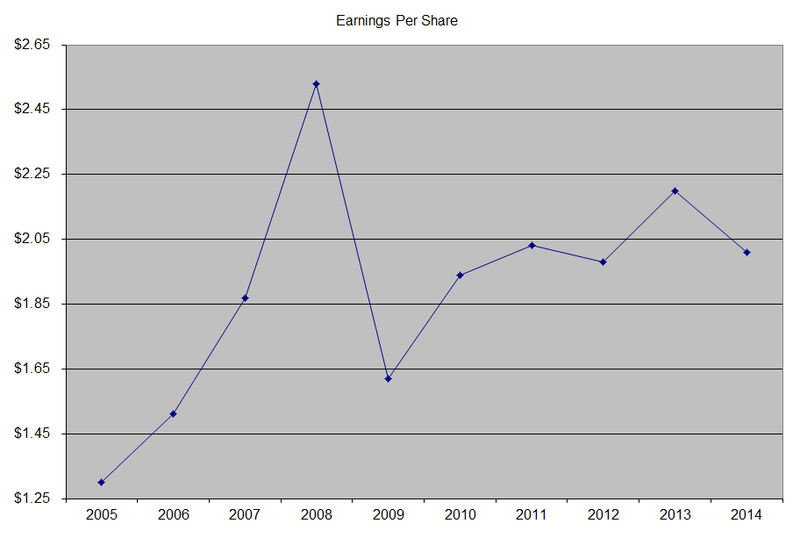 The thing that I do not like however is the high payout ratio, and the slowing down of earnings growth. That being said, I believe Unilever is a good hold for long-term investors. Recent changes in tax laws have made it possible for some people in the US to potentially defer over $60,000/year in a Roth IRA. This is perfectly legal, but requires some research upfront in order to see if you qualify, and whether it makes sense to do it. I believe that this article will be relevant for only a portion of you, because this opportunity might not be available for everyone. This new opportunity includes maxing out a Roth 401 (k) for $24,000, maxing out after tax contributions for the remaining $35,000 (assuming no employer match), as well as maxing out a Roth IRA with $6,500. The article will try to explain how some people can save $60,000/year in a Roth IRA per year, and assumes they are over the age of 50, earn more than $60,000/year, and are able and willing to defer that much in a retirement account. Nothing in this article should be considered tax planning advise for you however - please remember to always speak with a Certified Public Accountant before making any tax planning decisions. As someone in the accumulation phase of my dividend investing journey, I end up paying a lot in taxes. In previous posts, I have discussed the strategies I am implementing in order to shorten my time to financial independence. Qualified dividend income is very tax efficient. It is quite possible to earn $90,000 as a married couple filing jointly, and pay no taxes if you have no other form of income. However, in order to get to that point, you would have to pay steep taxes in the accumulation phase. A married couple whose taxable income exceeds $73,800 in 2014 would have to pay 15% on dividend income received. By paying expensive taxes on dividends today, you are essentially shortchanging your full potential. If you can somehow avoid paying taxes on dividend income and capital gains in the accumulation phase, you can potentially shave a few years of working. I don’t know about you, but it makes sense for me to avoid filing TPS reports for 2 – 3 extra years, if I have the option to not file them. Of course, if you enjoy coming in on Saturdays and Sundays, then chances are you won’t like this article. Many investors I talk to have used Roth IRA’s to soak up as much in quality dividend paying stocks as possible. The Roth IRA allows them to withdraw contributions at any time, lets money compound tax-free forever, doesn’t have required minimum distribution requirements for the original contributors and its earnings are not taxable if withdrawn after the age of 59 ½ years. The main problem with the Roth IRA is that contributions are limited to $5,500/year for every person under the age of 50 who has employment income. If you are over the age of 50, you can defer $6,500/year. This is not a lot to make a serious dent for you however, especially if you are one of the big savers who dreams of early retirement on your own terms. To add insult to injury, workers who make too much money are not allowed to put money in a Roth IRA. Luckily, there is a backdoor solution, where you can make a non-deductible contribution to a regular IRA, and then rollover the money into a Roth IRA. This involves more paperwork, but achieves the result. There is another way to contribute up to $18,000/year in a Roth 401 (k) account as an employee. The problem is that not every employer allows it, some 401 (k) plans have terrible investment options, and not many 401 (k) plans offer a brokerage window to select your own stocks. The nice thing however is that even higher earning employees can contribute to the Roth 401 (k). If you are older than 50, you can take advantage of the catch-up contributions which are $6000 extra. Some 401 (k) plans allow employees to make after-tax contributions to their 401 (k) plan. This is different than after-tax Roth 401 (k) contributions. The contributions I am talking about today are called after-tax contributions. Some 401 (k) plans allow their participants to contribute money after-tax. Up until now, it didn’t make sense to put after-tax contributions to a 401 (k). However recent changes made it potentially profitable. One thing you might want to know is that the amount you can defer in your 401 (k) is limited to $53,000/year for those under 50 and $59,000/year for those over 50. This includes not only your employee contribution of $18,000/$24,000/year, but also the employer match. Anything left over could be put in a 401 (k) amount as an after-tax amount. If you make $80,000/year, and your employer matched 4% of your pay, that is a neat $3,200. Employer matching contributions are always pre-tax however. Either way, an employee under the age of 50, who earns $80,000/year, gets a 4% match and maxes out their 401 (k) with $18,000, can potentially get $21,200 deferred in their 401 (k). They can then contribute up to $31,800 in an after-tax 401(k). This is calculated as the difference from the limit of $53K, minus the $18K in annual contribution, minus the $3,200 matched by the employer. For someone over the age of 50, they can contribute $37,800 more, due to the $6000 catch-up contribution. The other hurdle that you want to check is whether the 401 (k) plan allows you to either transfer those after-tax contributions to a Roth IRA account, or if it allows you to do a Roth conversion within the 401 (k) account. If your plan allows you to make after-tax contributions, but does not allow you to convert those immediately into a Roth IRA or Roth 401 (k), then the information in this article might not be worth it for you. This is because if your after-tax contributions are left in a regular 401 (k), any gains are treated like ordinary income upon distribution. Since you don’t want to pay ordinary taxes on investment income, it made no sense to use after-tax contributions before. However, under current legislation, when you quit your job, you can transfer the after-tax contributions to a 401 (k) into a Roth IRA. The gains from those money will be transferred to a regular IRA. If you want to avoid this, you have to convert the after-tax money to a Roth IRA/Roth 401 (k) right away. That way, all gains from those contributions are Rothified and you will never have to pay income taxes on them under current tax laws. However, if you are about to retire from your job within 2 - 3 years, it might still make sense to do the after-tax contributions in a 401 (k), since you are less likely to have earned significant returns over that short period of time (unless you are Warren Buffett, in which case thank you for reading my humble site). But everyone's situation is different, which is why the goal of my article is to tell you there is an opportunity to potentially put $60,000/year in a Roth IRA, and for you to start your research, in order to determine if this move is right for your financial situation. So to summarize, it is possible for someone over the age of 50 to potentially contribute over $60,000/year in a Roth account. To do this, they need to max out their Roth 401 (k) account with $18,000/year. Then they need to max out their after-tax 401 (k) account with the difference between $59,000 contribution limit, minus the $18,000 Roth 401 (k) contribution, and the employer match. Those after-tax funds would then have to be immediately Rothified either by converting them to a Roth inside the 401 (k) account or by taking an in-service distribution from the 401 (k) account on the after-tax dollars into a Roth IRA. In addition, you can also contribute to the regular Roth IRA up to $6,500/year. Unfortunately, not all company 401 (k) plans offer the option to make after-tax contributions, and from those that do, not all allow employees to transfer those contributions into a Roth IRA or a Roth 401 (k) while they are still employed by the company. However, contacting your HR department with a request to make the option for an In-Plan Roth Conversion available, might do the trick for you. If they allow it, great. If not, there might be other companies available that offer this for highly sought out employees like you. The other thing to consider with this tax break is the fact that it could be subject to changes. So if you are able to, it might make sense to research this as soon as possible. Otherwise, it might not be even relevant if you read the article some time in 2016. Full Disclosure: Initially I though I was unable to perform this feature, since my HR department doesn't allow for In-Roth Conversions on after-tax accounts. After talking to several people however, I realized they DO allow it. As always, please discuss your tax situation with a CPA, before making any moves. Colgate-Palmolive Company (CL), together with its subsidiaries, manufactures and markets consumer products worldwide. The company operates in two segments: Oral, Personal and Home Care; and Pet Nutrition. The company raised its quarterly dividend by 5.60% to 38 cents/share. This marked the 52nd consecutive annual dividend increase for this dividend king. In addition, the company approved a $5 billion stock buyback to last for the next 3 – 4 years. The ten year dividend growth rate is 11.50%/year. Currently, the stock is selling for 23.30 times forward earnings and yields 2.20%. Check my analysis of Colgate-Palmolive. Wal-Mart Stores Inc. (WMT) operates retail stores in various formats worldwide. The company operates through three segments: Wal-Mart U.S., Wal-Mart International, and Sam’s Club. The company delivered a disappointing dividend raise to its quarterly dividend of 2.10% to 49 cents/share. This marked the 42nd consecutive annual dividend increase for this dividend champion. The ten year dividend growth rate is 14.80%/year. However, this is the second year in a row where Wal-Mart raises its dividend by a disappointing 2%. Given this new fact, I will not be adding any new funds to my position in the company. However, I will keep my shares and allocate dividends elsewhere. Patience and low turnover are some of the surprising lessons behind my analysis of historical stock returns. Currently, the stock is selling for 16.90 times forward earnings and yields 2.30%. Check my analysis of Wal-Mart Stores. The Coca-Cola Company (KO), a beverage company, manufactures and distributes coke, diet coke, and other soft drinks worldwide. The board of directors hiked Coca-Cola’s quarterly dividend by 8.20% to 33 cents/share. This marked the 53rd consecutive annual dividend increase for this dividend king. The ten year dividend growth rate is 9.30%/year. Currently, the stock is selling for 21.10 times forward earnings and yields 3.10%. Check my analysis of Coca-Cola. T. Rowe Price Group, Inc. (TROW) is a publicly owned asset management holding company. The firm provides its services to individuals, institutional investors, retirement plans, financial intermediaries, and institutions. The board of directors hiked the company’s quarterly dividend by 18.20% to 52 cents/share. In addition, a $2/share special stock dividend will be distributed to shareholders. This marked the 28th consecutive annual dividend increase for this dividend champion. The ten year dividend growth rate is 16.60%/year. Currently, the stock is selling for 17.20 times forward earnings and yields 2.50%. I analyzed T. Rowe Price Group and should be posting an updated analysis soon. Please stay tuned. Kimberly-Clark Corporation (KMB), together with its subsidiaries, manufactures and markets personal care, consumer tissue, and health care products worldwide. It operates through four segments: Personal Care, Consumer Tissue, K-C Professional, and Health Care. The company raised its quarterly dividend by 4.80% to 88 cents/share. This is the 44th consecutive annual dividend increase for this dividend champion. The ten year dividend growth rate is 8.20%/year. Currently, the stock is selling for 19.40 times forward earnings and yields 3.20%. Check my analysis of Kimberly-Clark Corporation. Nestlé S.A. (NSRGY), together with its subsidiaries, provides nutrition, health, and wellness products worldwide. The company delivered a disappointing dividend raise to its quarterly dividend of 2.10% to 49 cents/share. This marked the 19th consecutive annual dividend increase for this international dividend achiever. The ten year dividend growth rate is 10.60%/year. Currently, the stock is overvalued at 15.80 times expected and yields 3.05%. At this stage I would see the stock as a hold at best, with dividends going to be reinvested elsewhere. Check my last review Nestle. I will need to refresh it with current data. Please stay tuned. Genuine Parts Company (GPC) distributes automotive replacement parts, industrial replacement parts, office products, and electrical/electronic materials in the United States, Puerto Rico, the Dominican Republic, Mexico, and Canada. The company increased its quarterly dividend by 7% to 61.50 cents/share. This marked the 59th consecutive annual dividend increase for this dividend king. The ten year dividend growth rate is 6.80%/year. Currently, the stock is selling for 19.90 times forward earnings and yields 2.60%. The company has been on my watchlist for a long time and I should consider initiating a position on dips below 20 times earnings. Check my analysis of Genuine Parts Company. AbbVie Inc. (ABBV) discovers, develops, manufactures, and sells pharmaceutical products worldwide. The company raised its quarterly dividend from 49 to 51 cents/share. This is the second dividend increase in less than an year – the previous one was from 42 to 49 cents/share. Abbvie was a spin-off from Abbott (ABT), formed in early 2013. The dividend has been increased for 2 years in a row now. The stock is selling for 13.90 times forward earnings and yields 3.30%. When I last analyzed the spin-off in early 2013, I concluded that the stock is a hold. I think I will keep holding on to it for as long as possible. NextEra Energy, Inc. (NEE), through its subsidiaries, generates, transmits, distributes, and sells electric energy in the United States and Canada. The board of directors hiked Nextera Energy’s quarterly dividend by 6.20% to 77 cents/share. This marked the 21st consecutive annual dividend increase for this dividend achiever. The ten year dividend growth rate is 8.40%/year. Currently, the stock is selling for 18.80 times forward earnings and yields 2.90%. Check my previous analysis of NextEra. The Sherwin-Williams Company (SHW) is engaged in the development, manufacture, distribution, and sale of paints, coatings, and related products to professional, industrial, commercial, and retail customers worldwide. The company operates in four segments: Paint Stores Group, Consumer Group, Global Finishes Group, and Latin America Coatings Group. The board of directors hiked the company’s quarterly dividend by 21.80% to 67 cents/share. This marked the 37th consecutive annual dividend increase for this dividend champion. The ten year dividend growth rate is 12.50%/year. Currently, the stock is overvalued at 25.90 times forward earnings and yields 0.90%. Lorillard, Inc. (LO), through its subsidiaries, manufactures and sells cigarettes in the United States. It operates through two segments, Cigarettes and Electronic Cigarettes. The company increased its quarterly dividend by 7.30% to 66 cents/share. Lorillard has been increasing dividends every year since going public in 2008. The stock currently sells for 18.70 times forward earnings and yields 3.90%. I should probably put this stock on my list for further analysis. I managed to initiate a position in T.Rowe Price (TROW) last week, and will likely add to it some more next week. I also added to Baxter (BAX), and will likely add some more next week as well. The other stock I added to was Kimberly-Clark, mostly to round off my odd-lot at one brokerage. I like to buy quality companies at attractive valuations. I look for quality in the companies I put my money to work. This means that I look for wide moats, strong brands, unregulated monopolies, strong competitive advantages and I don’t like to see change in the business models. If you are the player number 1 or 2 in a given niche, and you don’t have much change in your industry, you can make a lot of profits over time, and earn high returns on invested capital. In addition, chances are that you will generate a lot of cash each year, and will be able to distribute those excess profits to shareholders. This “monopoly” position could translate into stable earnings and profits throughout various phases of the economic cycle, high margins, and much lower likelihoods of cutting dividends during the next recession. Since I plan on living off dividends in the future, it is important to have a reliable stream of cold hard cash deposited to my account even during the darkest of times. I have a few quality companies I like such as Church & Dwight (CHD), Moody’s (MCO) and Hershey’s (HSY). They are all selling for very high valuations today – above 20 times forward earnings each. Another high quality company I like is Brown-Forman (BF.B). It sells for close to 30 times forward earnings. Luckily I do own some shares in Brown-Forman, although not enough. Despite the fact that I am very confident in the abilities of each one of those companies to keep printing money for shareholders in the next 10 – 20 years, I do not want to pay too much for those dollars. As a passive long-term buy and hold investor, my returns are largely dependent on the performance of the business I invest in. If that business increases earnings per share over time, and growth the dividends, I will do well. This would occur of course, as long as I do not overpay for that business. After all, my capital also has opportunity costs – meaning that I am better off in a dividend compounding machine at a lower valuation, if everything else is equal. For example, Hershey is selling for 24.30 times forward earnings for 2015 of $4.36. The company has not cut dividends since 1974. It has raised dividends in every single year since 1974, except for 2009. 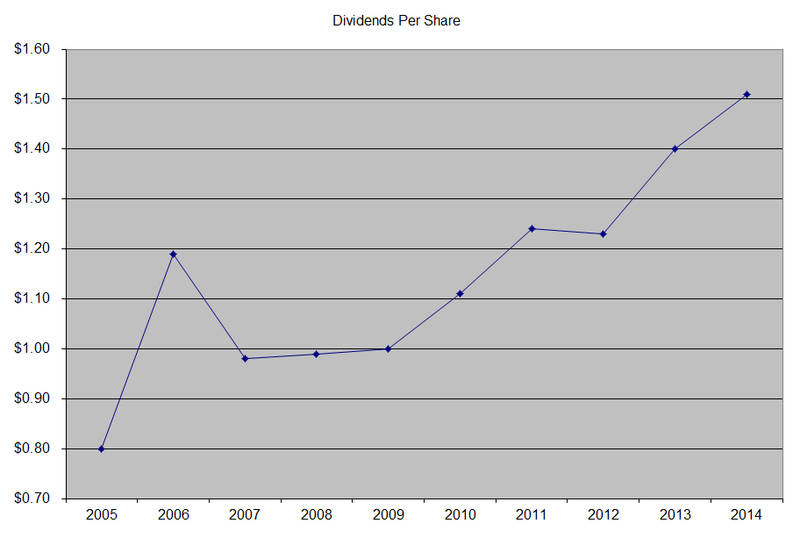 It pays $2.14 in annual dividends, for a current yield of 2%. Earnings per share increased from $2.30 in 2004 to $3.77 in 2014. The company paid out $0.84/share in 2004 in dividends to shareholders. The stock price at the time of this writing is $106.02. - What happens if there is a change in the product or the competitive landscape? - What happens if there is a valuation compression? For example, is it worth it to pay a premium at 25 – 30 times earnings for a company which could sell for 15 times earnings in 10 or 20 years. - What happens if growth slows down? Are current growth expectations overly rosy or overly pessimistic? After all, once a certain size is reached, growth could be very difficult to achieve. - Are there other compounders available at better valuations? Just because Hershey is a wide-moat compounder that will likely do well in the next 20 years, that doesn’t mean that other quality compounders might not be available at better starting valuations. For example, a few weeks ago, PepsiCo and McCormick were available at cheaper valuations than today ( less than 20 times earnings). In the case of Hershey, I expect it to earn $4.36 in 2015, and pay $2.14 this year. I would then expect it to grow earnings per share by 7%/year over the next 2 decades, and to pay approximately 50% of earnings each year in the form of dividends. This means that the company will be earning $8/share in 2024, and would have paid $30 in dividend income between 2015 and 2024. At a P/E of 15, this could translate into a price of $120/share in 2024. This means that an investment in Hershey today could translate into a 42% return in about a decade. At the time of writing this, the shares are selling for $106. A 42% return in 10 years is not an adequate return on investment for my money. I would much rather have my principal and income double every 10 years at the very worst. If we use historical equity returns of 10%/year as a benchmark, I would expect that buying a stock and reinvesting dividends there will result in doubling of my capital and income roughly every 7 years or so. The P/E of 15 of course assumes an increase in interest rates, which translates into lower P/E ratios for large-cap common stocks. A 7% annual increase in earnings per share is slightly lower than forecasts, but it is more conservative, given the competitive nature of the confectionery industry, exposure to commodities on the cost side etc. I essentially came up with the estimates by averaging out the various possibilities times the expected probability of event occurring. Therefore, we saw that in the first decade, even the best dividend compounder might not be worth purchasing at overvalued prices. However, if the company keeps growing earnings per share at the same rate of 7%/year for the next 10 years, the picture is somewhat mitigated. By 2034, the company could earn $15.77/share, and be paying $7.88/share in annual dividend income. Using a P/E of 15, the stock price translates to $236/share. In addition, between 2015 and 2034 the company would have generated $89.33/share in dividend income to the shareholder. This translates in over $325 worth of money at the end of the 20 year period. If the dividend is reinvested at 20 times earnings, the investor in 2034 is left with 1.50 shares for every share invested in February 2015. The total worth is approximate $355. You could see that even if a high initial price, the consistent growth, and even with reinvesting dividend at an inflated price, the investor came out ahead and still realized a good return. This is why Warren Buffett says that "It's far better to buy a wonderful company at a fair price than a fair company at a wonderful price." A great compounder will produce best results if left uninterrupted for a couple of decades. Even if the original price is a little too high, it will deliver good returns on investment. Of course, given the fact that we have limited investment timeframes, it is not efficient to waste the first decade of the compounding process, and only hoping that the subsequent decade afterwards bails you out. I assume your investment timeframe is 30 years. In reality, my investment timeframe is hopefully 40 – 50 years. Very often, the price returns generated from companies comes unexpectedly. This is why I believe it is important to just sit tight, and do nothing for as long as possible, even if companies you own experience temporary setbacks. It would have been very difficult for an investor to hold for a long ten years, while generating a meager 42% in total returns. This is because patience usually would run out, and they would start questioning themselves and their strategy. If they sold after year 10, they would have missed out on most of the gains. This is why it is important to purchase shares only at valuations that make sense, and to avoid overpaying for companies. It is also important to not just look at the stock price, and not avoid the folly that you will be selling off assets to live in retirement. By selling off assets in retirement, you are exposing yourself to sequence of return risk. Sequence of return risk is the risk that volatility in year to year stock returns could result in you running out of money in retirement. I do not know about you, but I would like to reduce the risk of outliving my money in retirement. This is why I focus so much on the growing dividend income stream. If I can live off the dividend income stream, I am much less likely to panic if the other stock market participants disagree that the company’s shares should be worth more. I view relying on stock prices alone, and selling off chunks of your portfolio, to be very risky. This is because stock prices are unpredictable – it could easily be feast or famine for the investor who sells off shares to pay for their retirement expenses. Dividends on the other hand provide always a positive return on investment, which is realized in cash, is more stable, and cannot be taken away from you. Even the study behind the current 4% rule, covered a time period when stock dividend yields were closer to 4% (1926 - 1993). Hence, I have a much higher confidence in the ability of a dividend portfolio to generate the necessary dividend income over time, than the ability to correctly guess stock prices and sell off shares to live during my golden years. Having a diversified portfolio of quality dividend growth stocks, purchased at attractive valuations, will mitigate the risk of outliving my money in retirement. I have a lot of smart readers, that check my articles every single day. I like interacting with them, and feel blessed that I am sharing their journey into learning more about investments. I had a reader who mentioned that they had an issue with investing in tobacco, oil and defense companies. He then asked me for a list of dividend stocks, which are not ethically challenged. I thought about this for a second, and responded that I cannot of a single investment, that no one can challenge on some sort of ethical grounds. The ethical investing dilemma always comes up when I have analyzed Altria (MO) or Phillip Morris International (PM) on this site. Every single time. I am not smart enough to say that my moral grounds are better than your moral grounds. I also understand that just because I find something to be immoral, that doesn’t mean others believe it to be immoral. In other words, you cannot say that you won’t invest in tobacco or defense stocks based on your moral grounds that they hurt people, and then go ahead and invest in a company that sells food for example or buy a farm, which could be investments that violate someone else’s principles. Food companies can be challenged by anyone, because they are blamed for the obesity epidemic in the US. In reality, I personally disagree with this statement, because people’s sedentary lifestyle is the thing to blame. Nevertheless, someone can make the argument that obesity related illnesses claim the lives of hundreds of thousands of Americans every year. Investing in US farmland could be an ethical issue as well, because it violates the principle of thou shalt not steal. How is buying farmland stealing though? Well, up until the early 1600’s, the territory of the Lower 48 states was inhabited by Native Americans. When the European settlers came to the US, they systematically pushed Native Americans out of their lands, and then killing many in the process – that includes children also. These days Wal-Mart Stores (WMT) and McDonald’s (MCD) receive a lot of negative publicity, because they pay their low-skilled employees low hour wages. Many are focusing on the fact that a person working full-time at either places is overworked, and is not paid a liveable wage. Therefore, many consider both companies to be evil, and they should therefore be ethically against investing in those companies. On the other hand, they are forgetting that most retail stores and fast food/restaurant chains pay low wages to their employees. Costco (COST) is the sole exception to the trend. Other than Costco, I doubt that the mom and pop stores that Wal-Mart put out of business, or the Targets or competing neighborhood grocery stores ever pay a higher wage to their store employees. I could argue that Wal-Mart is saving families thousands of dollars each year. Plus, they create opportunities for people that mom and pop might not provide. In addition, retail jobs are low skilled, and can be done by almost anyone. Because there is not specialized knowledge required, it is not at all surprising that wages are low. And do not forget that Wal-Mart sells goods that are most likely made in the same factories that most of the items you shop at other stores. Chances are that mark-ups are the major difference. If wages were raised, then a lot of low skilled employees will be out of jobs. Automation will reduce the need for certain skills at higher wages. My first job ever was at a McDonald’s (a long long long time ago). Working there really helped me realize I don’t want to work there my whole life. This is why I invested the money I earned there in my education, and learned skills which are valued and sought after in corporate America. They provided me with opportunity – the mom and pop stores I applied to didn’t want to hire me. So I am glad they went out of business. But i liked the way McDonald's ran its operations. This is why I am an investor in the company - I do not see things as black and white unlike so many other individuals out there with polarizing views on the world. It is not perfect, but it is also an easy target for hatred because of its size. Another unethical thing could be simply purchasing shares in companies when they sell-off. I like to focus on quality companies, but do not like paying top price for them. As such, I find it much more appealing to buy Coca-Cola (KO) when it has sold off by 20 - 25%. This is because such a decline could lead to shares selling at attractive valuations. However, if you purchased shares at a discount from the high, chances are that someone else sold it to you. What if this person sold to you, because they had a margin call, and simply had to sell. For example, during the financial crisis of 2008 - 2009, many people sold all of their stocks because they were unemployed, and needed money to live on. Selling their shares might have been the only choice for them to get money, in order to survive, no matter if they sold at the bottom. Or what if this person had a medical emergency, and had to sell their Coca-Cola stock, in order to pay for the cancer treatment of their small child? Would taking advantage of a fellow human being in dire need by buying shares at ridiculous discounts sound ethical or moral? The goal of this article is not for me to tell you what is right and what is wrong. The goal is to show you that anything you say and do could be viewed as violating someone’s ethical rules. I am personally fine with someone smoking and drinking and eating fast food, because this is their choice. As long as you are not hurting others, and you are not breaking any laws, this is an activity you can do. Plus, smoking provides a lot in tax revenues, which can be used for a lot of society's good. Investing for a profit is very difficult as it is today. By applying arbitrary rules in investment selection, that have nothing to do with the underlying profitability of the business, you are essentially limiting yourself to never investing in anything. Your goal as an investor is to earn money, and not to be a moral/ethical arbiter for the world. If you don’t want to invest in certain companies, don’t do it, but you have to realize that what you see as moral or ethical, might be viewed as unethical by someone else and vice versa. Warren Buffett is the super investor who is the hero of ordinary people and investors alike. While he has always been a ruthless businessman, he has also made plenty of people rich, has kept a very clean image of a successful yet folksy billionaire, and is liked and praised by many of his generous donations. Anyone who put $20/share in Berkshire Hathaway stock in the 1960s is now sitting on shares worth north of $200,000/each. We all know the story of Buffett however, and many are familiar with the way he turned around the ailing textile mill Berkshire Hathaway into a diversified conglomerate with interests in insurance, railroads, candy, utilities to name a few sectors. His company also holds a pretty impressive stock portfolio worth tens of billions of dollars. Now that Warren Buffett is about to turn 85 in August, many investors are asking themselves what would happen to Berkshire Hathaway after he is no longer in charge? The answer of course lies in the way that Berkshire Hathaway was formed in the first place. Berkshire Hathaway was not formed in one single day. Rather, it was built brick by brick, over the course of 50 years. The basic idea has been to invest the excess cash from existing businesses and the float from insurance operations into more businesses, which generated even more cash to be invested. Buffett does not manage each one of those businesses. Instead, he has delegated those day to day management duties to the point of abdication. That doesn’t mean he doesn’t monitor the performance of those businesses. However, he has let the executives from each company under Berkshire’s umbrella to manage the operations in their own way. The only stipulation has been to send excess cash flows back to Omaha for Buffett to allocate. This similarity to what dividend investors do on a regular basis has led me to believe that Warren Buffett is essentially a dividend investor. This is of course where the genius of Warren Buffett comes – he is trying to allocate that excess capital by purchasing more businesses or shares, and earn a high rate of return. Over the past 60 – 70 years, Buffett has proved his business and investing acumen in allocation of capital in a variety of assets and asset classes such as businesses, stocks in those businesses, and a range of derivatives, currencies, real estate to name a few. The reason for his success is his innate desire to keep learning, and keep a level head on what is actually happening in the world. Unfortunately, this is the one aspect that will be forever gone once Buffett steps down. If he is no longer in charge of Berkshire, the underlying group of businesses will keep churning out record profits over time, since they are managed by experienced managers. The one drawback will be that capital will no longer be allocated by Buffett himself. As a result, it is very much possible that the future success of Berkshire will not be as good as the past. However, I believe that Buffett has certainly thought about putting systems and procedures in place, in order to address the capital allocation problem. He seems to be grooming Todd Combs and Ted Weschler to take on the role of managing billions of dollars of excess capital. Those two fellows have done very well managing money in the past. Chances are that over long periods of time, they will do well, even with short-term bumps on the road. Buffett’s other responsibilities will likely be split to one or two other persons. I think that in the future, Berkshire will have to make more sizeable acquisitions, in order to deploy those growing cash piles to work for shareholders. The risk of course is that whoever is in charge, could do something stupid like engage in empire building. Of course, we all know that you cannot simply buy an ever bigger and bigger business every year, since those things take time to accomplish, you need agreement from others, and regulators would have to provide more input in order to prevent a monopoly forming in a certain industry. Plus, a company with $300+ billion in market capitalization has a big disadvantage in terms of size. There are only a few publicly traded companies in the world which are larger than Berkshire. Therefore, at some point in the next decade, it would be very difficult to grow even by acquisitions, since returns would be pulled down by forces of gravity. The important thing of course is that acquisitions never work out as expected, and thus one has to be very careful what they get themselves into. There are only so many good quality businesses in the world, and throwing hundreds of billions at the problem might create some nasty behavior that shareholders could pay for. Excess cashflows could also be plowed into international acquisitions. Berkshire only has a few international businesses, which is obviously an opportunity for them. If they get more popular internationally, then it is highly likely that business owners who are thinking of disposing of their businesses, could consider selling to Berkshire only. I think that excess cash could easily be taken out of Berkshire Hathaway by declaring a dividend to shareholders. If you no longer have a super investor handling the capital allocations, it might be wise to send the cash directly to shareholders. Given the depth of operations, I would consider that Berkshire Hathaway will be able to pay and grow its dividend for years into the future. I would not be surprised if Berkshire Hathaway eventually becomes a dividend achiever and even… a dividend champion one day. If General Electric (GE) could do it, or 3M (MMM) could do it, then so can Berkshire. Even after paying a dividend, there will likely be more cashflow that is left to build up in corporate coffers. I think that Berkshire can use that cash to fund stock buybacks during the next stock market panic. Those usually happen once every 5 years or so, and are tough to predict. Either way, the major competitive advantage of Berkshire Hathaway will be its massive size of operations. It could be the lender or investor of last resort to other businesses, particularly in times of trouble in the economy. This is due to the diverse streams of income coming from all businesses under the Berkshire Hathaway umbrella. Plus, keeping at least $20 billion in cash at all times will ensure the stability of the organization during the next recession or crisis. The other option behind Berkshire is that the operation becomes so gargantuan in the one or two decades after Buffett is no longer in charge, that the company is split into pieces. While Buffett and Munger have always said that Berkshire will stay intact, I am not so certain about it. I believe the seeds of a potential break-up of Berkshire Hathaway are planted in the separation of different businesses under different industries under the Berkshire Hathaway corporate umbrella. At some point, it might be more efficient to spin-off the Utility, Railroad, Manufacturing, Retail, Finance & Insurance into separate entities. A company that gets to be too large can become a bureaucracy, become slow to move, and might not allocate capital at best rates for shareholders. While size can be very helpful to weather cyclical storms in the economy, it could also mean that prioritizing investment might be very difficult when you have so many businesses and so many industries. Therefore, it might be better off to split into multiple separate companies, in order to focus effort in a more efficient way. Of course, we will hear what Buffett and Munger have to say about the next 50 years of Berkshire Hathaway in the next letter to shareholders. I find this topic of interest, mostly because I think about succession planning for my own affairs. My goal is to organize my portfolio in a way that even a few decades after I go to hell, it will still generate a growing stream of dividend income to heirs or charities. In order to ensure that, I need to focus on businesses that are built to last, and therefore I could see doing what they are doing now with minimal changes to their operations and profitability. It is therefore of utmost importance to select only those businesses which are of very good quality, and which I believe will be able to compound earnings, dividends and wealth in the foreseeable future. The most important thing is to buy and hold those quality dividend stocks for the long run, and strive for a holding period of "forever". Warren Buffett is one of the best investors in the world. The most interesting fact about him is that he started making a lot of money after retiring twice – first time in 1956 and the second time in 1970. The first retirement idea he had was to run a hedge-fund like partnership, which he closed in 1970. The second retirement idea he had started in the 1960s, when he bought a struggling textile factory called Berkshire Hathaway at a heavy discount to book. While he calls this acquisition one of his biggest investment mistakes of his career, he has nevertheless managed to transform Berkshire Hathaway from a struggling company to a thriving conglomerate with a $300 billion market capitalization. This was mostly due to the fact that he is a learning machine that has accumulated business knowledge at a rate of 70 hours per week for 70 years. Accumulated knowledge is like compound interest, which pays tremendous dividends over time. For example, he purchased a massive block of Coca-Cola stock between 1988 and 1994, after using the product for over 50 years. Another example includes his ivnestment in IBM in 2011, after reading the annual report for the preceding 50 years, and investing in a company that competed with Big Blue in the 1950s. While his investing prowess is unmatched, he has had a few levers within his control that helped him in his ascend to one of the world’s wealthiest people. The major lever that helped him earn his first $20 million were the performance fees he earned on Buffett Partnership partners. In fact, if returns exceeded 6% for a given year, he earned 25% of the profits above that threshold. As the level of assets increased, and as he was able to compound partners’ money at market-beating returns, his share turned him into a millionaire by his early 30s. By the time BPL was closed in early 1970, Buffett was worth over $20 million. This is where the next chapter of Buffett’s investing prowess started. He was able to transform Berkshire into a powerhouse, by investing heavily into insurance companies like National Indemnity, GEICO, General RE to name a few. Insurance companies generate so called float, which is the amount of premiums received by policyholders. Overall, the amount of insurance premiums received tends to increase over time, which provides cash in the coffers of insurance companies. This cash is ordinarily invested in fixed income instruments like corporate bonds by most insurance companies. In general, his companies have managed to turn a profit in the difference between paying out claims and receiving premiums from policyholders. In the hands of Warren Buffett, that float was golden, as it represented free money he is given to invest, and was being paid to hold it. He was able to use the float generated by insurance companies as a defacto free leverage that allowed him to purchase even more businesses and more stocks, that further magnified his returns. In essence, he is a superinvestor, and his results have benefitted immensely from this free form of leverage. However, I believe that even an ordinary investor with an ordinary investment records can benefit from the type of leverage, that float provides. The big issue is that as an ordinary investor who does not have tens of millions of dollars to buy an insurance company outright, it is almost impossible to use the same lever as Buffett. However, as I have been thinking about it, I could think of a few scenarios within the reach of ordinary dividend investors, where they have access to float. 1) When you purchase quality dividend paying stocks, the investor receives dividends today. However, as the company earns more, and pays more in dividend income over time, the shares become more valuable over time. If the investor decides to sell, they would have to pay hefty capital gains taxes on their money. In essence, the amount of the unrealized capital gain times the taxable rate of the shareholder is a defacto interest free loan from the US government, that subsidizes the long-term buy and hold investor. As long as the investor never sells, they never have to repay that float. 2) When you put investments in a tax-deferred account such as an IRA or 401 (k), you are receiving a tax deduction today, but promise to pay taxes on distributions at some future point in time. As a result you can end up purchasing dividend paying stocks at an immediate 25% discount. As you earn more dividends on investments, and as they appreciate in value over the course of several decades, the potential liability to the IRS increases. However, until you have to make distributions at the tender age of 70 and ½ years of age, you don’t have to pay taxes. Those tax liabilities are there, and in the eyes of Uncle Sam are not yours, but they nevertheless provide an interest free loan, and a sort of float for you to use in the meantime to propel your family to riches. 3) When you sell puts on a company stock, you are contractually obligating yourself to purchase the stock at a predetermined price and date, if it trades below the strike price. You are paid an option premium for this trade, whose value depends on factors such as interest rates, volatility of the stock, dividend yields and how far the option strike price is from the current stock price. If the stock is above the strike price at options expiration, you can keep the premium. If the stock price is below the strike price at expiration, you have to purchase the stock, even if it is much lower than the market price at the time. The premium you earn can be used to buy more stock. Either way, it is a win-win for the option seller, since they either end up with option premium cash in their account or with shares in a good quality company at a lower price than the competition. 4) The other type of float that ordinary investors can generate includes taking on margin loans and buying stocks on margin. You are therefore using borrowed money from your broker when you buy stock on margin. If you use brokers like Interactive Brokers, you are paying something like 1.60%, which is low. If you purchase a stock like Coca-Cola (KO) or General Mills (GIS), which pay around 3% today, and are expected to grow dividends over time, you could end up having dividends pay off the interest and principal. As long as the dividend is higher than the amount of interest paid on the margin loan, it is possible that eventually the dividend will pay for the stock. The downside to this strategy is if stock prices tank, and you need to put more money into the account. This is the dreaded margin call. If you do not have any more money to put, you can effectively lose everything. This is why purchasing shares on margin is so risky. Even if a stock price declines temporarily, and you know underlying fundamentals are great, the market participants might disagree with you and keep prices low for longer than you can remain liquid. I recently signed up for a Health Savings Account (HSA) with my employer. A Health Savings Account is a tax-advantaged medical account which is available to individuals in the US who have enrolled into a high-deductible health plan (HDHP). For 2015, individuals cannot contribute more than $3,350/year, while families cannot put more than $6,650. There is a catch-up contribution of $1,000 for those 55 or older. Individuals who are enrolled in Medicare are not eligible to open an HSA. I signed up for the HSA mainly as another way to defer money for future investment. As most of you know, I am already maxing out other tax-deferred accounts in an effort to cut one of my largest expenses. An HSA offers a triple tax advantage in most states. The contributions are before tax, which means that the account holder does not pay Federal, State and FICA taxes. If you were in the 25% marginal tax bracket, had a 5% state income tax rate, and you didn’t pay 7.65% for FICA, you will end up saving 37.65% merely by contributing to an HSA account. On $3,350, this comes out to $1,261.27 in tax savings right off the bat. The money can be used for qualified medical expenses at any age, without having to pay any taxes on such withdrawals. However, support documentation should be retained in case of an audit. Withdrawals not for qualified medical expenses are subject to a 20% penalty and income tax. After age of 65, withdrawals are tax-free for any type of distribution from the account. I was attracted to HSA’s because of the large tax deduction. When I contribute money to a tax-deferred vehicle, I have more money under my control, since I reduce the largest expense in my household budget ( taxes). I have done a similar thing by maxing out 401 (k) and Sep IRA contributions since early 2013. I was also attracted by the fact that money put in an HSA account compounds tax-free. In addition, unlike a Flexible Spending Account (FSA), the money does not have to be used by a certain date. Hence with an HSA the money carries over from one year to the next, and thus stays in the account and could potentially compound over time. One of the major drawbacks to HSA accounts is the large monthly fees with many providers. When I reviewed different providers, it looks like a minimum account balance that is anywhere between $3,000 - $5,000 has to be maintained in cash, in order to avoid a monthly charge in the range of $2 - $5/month. Many employers tend to cover this amount for their employees, so this is a benefit. However, there are additional fees on each withdrawal, ordering checks to pay for items, opening fees, account closing fees etc. Plus, there are monthly fees if you plan to invest that HSA money into something. This is in addition to the fees for failing to maintain a minimum balance in the account. In addition, most of the investment options are limited to mutual funds, some of which have really high expense ratios that come close to 1%/year. The one positive thing however is that a person is not stuck with an HSA provider, if their employer offers a crappy HSA provider. One can simply rollover the funds from their original HSA administrator, to the HSA administrator of their choice. This is the thing I plan to do, once I max-out the 2015 contribution. Until then, the money is probably going to stay in cash as it builds up every pay period evenly in 2015. The other drawback is the low limits on how much one can potentially defer. If limits for individuals are increased to at least match those on IRA or Roth IRA accounts, this would be a good start. I looked at different providers, and looked at their costs to have an account, and availability of investment options. In my research, I give extra points for companies that are not going to charge me $4- $5/month on a $3,000 - $6,000 balance that takes 1 – 2 years to build up, or at least will not charge me monthly fees after my total balances exceed a reasonable amount of dollars. I am talking about eliminating as much in monthly or annual fees are possible, since some administrators tend to charge you an HSA Bank fee if you have less than $3,000 - $5,000 in a bank, in addition to charging you a monthly brokerage fee. I also wanted to find the broker that would allow me as much flexibility as possible in choosing investments that do not cost me a lot. My research has identified Saturna Capital as potentially the best options for me. There are no monthly fees, and there is a range of investments such as individual stocks and mutual funds that are available. The commissions are steep at $14.95/trade, and there is an annual inactivity fee of $12.50/$25 for mutual fund/brokerage account. However, if I make at least one transaction per year, this fee is waived. If I end up putting $3,000/year in Saturna Capital and purchase one investment, I will end up paying no more than 0.50% on the total amount invested. Since I plan on building out this HSA account for as many years as possible, I would likely keep maxing out this account, and buying one stock position per year. I will reinvest dividends selectively, and put them to work with the new position. If you like to drip, Saturna Capital charges $1 per reinvestment. I had never heard of Saturna Capital before, so I did some research. The company is SIPC insured, which is good. The downside is that they seem to require new account-holders to mail in information and forms to open an account, and it cannot be done online. Of course, this is a small price to pay for keeping costs to the minimum, and allowing the maximum amount of compounding free of costs. The second option I would go with, is Wells Fargo. It looks like HSA accounts with over $5,000 in combines cash and investments do not have a monthly fee assessed. This is good. The not so nice thing is that one is limited to a list of mutual funds only, whose expense ratios are really high. The lowest cost stock mutual fund was an index fund with an annual expense of 0.25%. The third option could be Fidelity, which charges an annual fee of $48. However, if your household has more than $250,000 in total assets at Fidelity, this fee is waived. Fidelity offers individual stock trades at $7.95/investment, plus it has a decent list of ETF’s or mutual funds with low costs if that’s your route. If you have a 401 (k) with Fidelity that you have contributed to for a while, this could be a good option. The thing to consider of course is that fees can change if minimum balances are changed as well. Plus, there might be fees assessed if you transfer money from one custodian to the next. My goal now is to slowly max-out the HSA limit of $3,350 in 2015, and then decide sometime in 2016 on which account to rollover that money to. Although HSA accounts have been around for approximately a decade, the amount of fees charged on them seems very high. Over time, I assume that those fees will decrease. But even if they stayed where they are, Health Savings Accounts make perfect sense for those like me who are looking for another vehicle where they get a tax deduction upfront today, and receiving a tax-advantaged growth of their investments. The real nice part is that after age of 65 I can withdraw the money for whatever reasons I desire, and will not have to pay any penalties (if the money is spent on non-medical expenses, it is taxed at ordinary income tax rates). I have decided that even if I have to end up with an index fund in that Health Savings Account, I would be better off than picking individual dividend stocks in a taxable account. Let me walk you through a hypothetical (made-up) calculation. I calculated that if I choose to invest $1,000 in an HSA that generates a net annual total return of 7%/year, I would end up with $5,807 in 26 years. This return assumes that no taxes are taken and also assumes fees paid are subtracted from returns ( meaning the gross return is slightly higher). However, if I were to earn those $1,000 from my day job but decided not to put them in an HSA, I would be left with $623.50. This is because I would be paying 25% Federal Tax, 5% State Tax and 7.65% FICA. If I managed to earn an after-tax annual total return of 9%/year for 26 years in a row, my account balance will be $5860. The break-even point will be 26 years. Of course I am not comparing apples to apples here, because an after-tax return of 9% in a taxable account usually requires a return above 10% even at today’s low rates on dividends and capital gains. To summarize, I believe that HSA accounts provide several benefits to investors who want to build retirement savings, and have exhausted common vehicles such as 401 (k) or IRA's. The first advantage of HSA's is triple tax advantage, because of the deduction for Federal, State and FICA taxes. This leaves more money working for the investor. The second advantage is tax-deferred growth of that capital for decades. The third advantage is that this money can be withdrawn at any time, penalty free if it is for qualified medical expenses. It can also be withdrawn penalty free after the age of 65. The money is taxed after the age of 65 if used for non-medical purposes at the ordinary income tax rates. The drawbacks behind HSA's include fees, low variety of investment options and the fact that annual contribution limits are low. Of course, for those of us who understand the power of compounding, we know that even a small contribution of $3,000/year over a period of a couple decades could turn into a few nice supplement to the retirement nest egg.